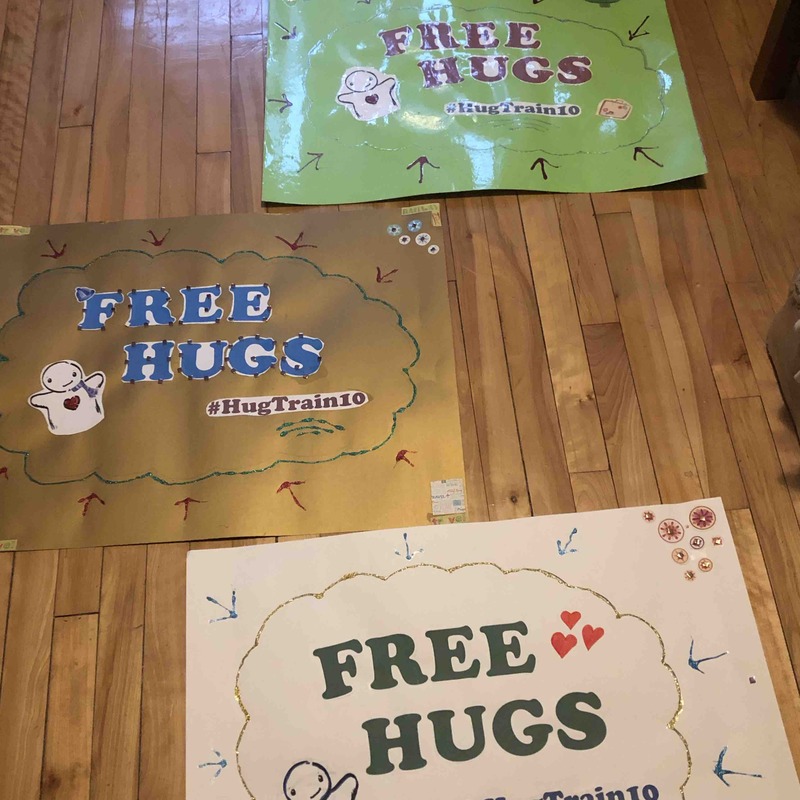 Fundraiser by Sylvie Moyal : 10 Years of HugTrain! Let’s Do It! To take on the loneliness epidemic by showing people the importance of vulnerability and compassion as well as demonstrating the huge impact of small actions that anyone can take! Since 2009, our founder has crisscrossed Canada and the US by train offering hugs to anyone who requests one during the holiday season. This will be the 10th Annual HugTour! Study after study has shown that loneliness is causing premature deaths at similar levels to cigarettes and obesity. Not only is it a major risk factor for suicide and an important contributor to anxiety and depression but it also has significant effects on our cardiovascular health, our brain function and our immune systems to name just a few. Hugs have been shown to have a positive impact on all of the health issues that loneliness causes, be they physiological or psychological in nature. They’re also a moment of shared vulnerability which increase trust and gives people a sense of belonging. Best of all, hugs are an example of a small action anyone can take to make the world a better place! 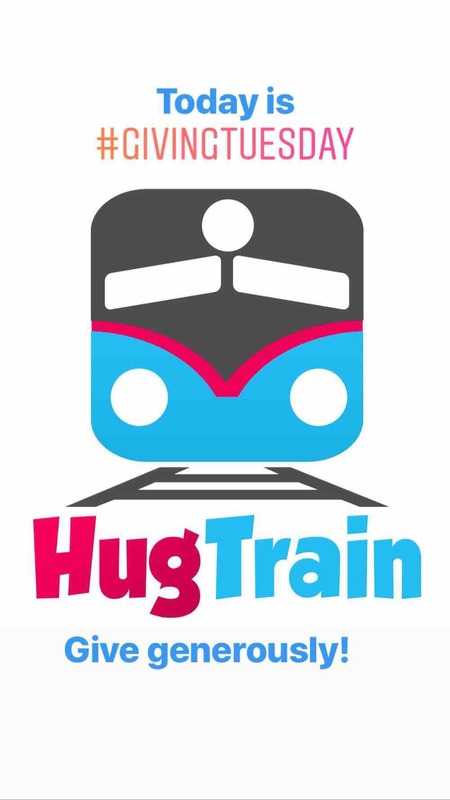 The 10th annual HugTrain will run from December 24th to January 8th stopping in Montreal, New York , New Orleans , San Antonio , Tucson , Los Angeles, San Francisco , Denver , Chicago, Pittsburgh , Philadelphia and points in between! If you are in one of these cities, please RSVP to our events on facebook so we can meet up! Invite your friends! This itinerary is a tribute to my friend Philip, a true hearted person, that the world lost in April at the age of 22 after a long struggle with addiction. May his memory be a blessing and may he rest in peace. Everything you contribute will be used to propel the HugTrain movement, take on the loneliness epidemic and help create a healthier, more compassionate world. Please give generously and feel free to contact us if you have any questions or suggestions! Hi everyone! I wanted to thank you again for all your help this year! I encourage you to check out the facebook page and instagram to see anything you have missed! Thanks to all of your generosity and to some careful spending (which still included paying it forward a few times) there is a surplus of 70 Canadian dollars and 60 US Dollars (in cash) this year! For the first time ever! Please let me know what you want me to do with it. Should I keep it for next year or donate it to charity? Two days to departure! We’re in good shape! Thanks to Julie and her family for the signs! Follow along on social media! 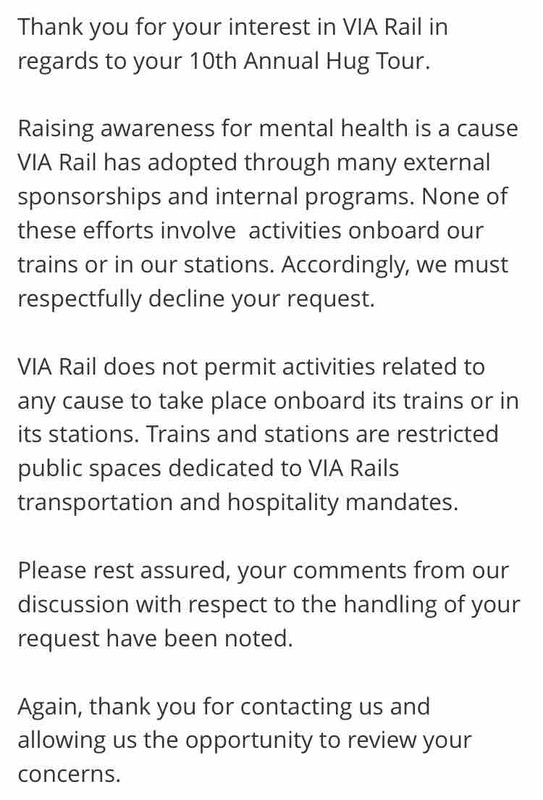 It’s with a heavy heart that I must confirm that VIA Rail has confirmed that Arié may not hug in its stations or on its trains. We apologise to anyone in Canada that was looking forward to a hug.